Amazon Price: $694.99 $199.99 You save: $495.00 (71%). (as of October 18, 2017 3:57 am - Details). Product prices and availability are accurate as of the date/time indicated and are subject to change. Any price and availability information displayed on the Amazon site at the time of purchase will apply to the purchase of this product. 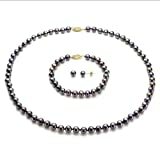 A Beautiful 14k Yellow Gold 6-6.5mm Freshwater Cultured Pearl Necklace 18" Length, with a Matching 7" Length Bracelet and a Button Shape Stud Earrings Set. We Carry Different Color of Pearl, and Different Size Per Pearl. Please Contact Us if You Do Not See What You Want. Perfect for Any Occasions.